3D mesh imports now (finally!) possible in Second Life! No, seriously… I have screenshots to prove it. This long awaited ‘holy grail’ feature in Second Life has now finally arrived on the main grid! The subject of numerous false starts, April fool’s jokes, and much controversy – it is now possible to import 3D models directly into Second Life. The implications from an architectural urban design and city planning perspective are obvious. Having to rebuild architectural models with a patchwork quilt of 10 meter prims was only feasible for the most dedicated and patient developers, and the frustration of abandoning 3D models that already existed as a matter of daily practice in architectural software in order to build the same model all over again with prims just wasn’t an easy sell to most would-be SL residents hoping to use the platform for architectural visualization and collaboration. Architectural Simulation, Virtual Architecture and Design Collaboration – it’s all on our new website. Check it out! It’s been a while since our last post, but we’ve been hard at work on some new projects we hope to publish soon! In the meantime, check out our newly renovated website: http://www.archvirtual.com We’ve made some exciting progress in technologies and methods for bringing architectural and city models into virtual environments, along with interactive features to augment and enhance those models. We will be posting more about these projects and services soon, so stay tuned! 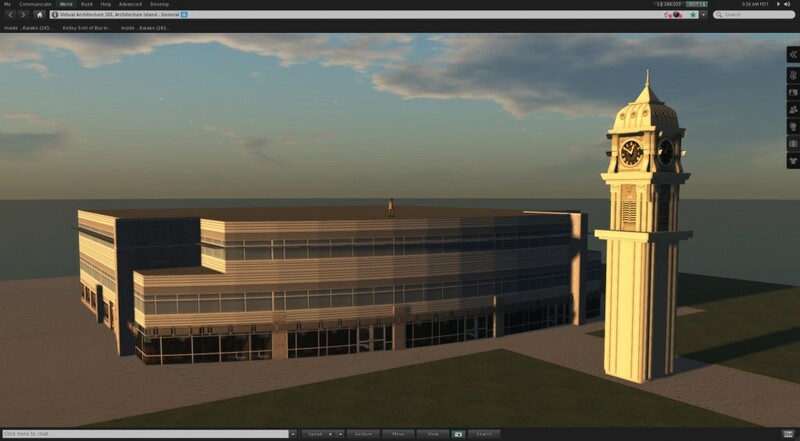 Architectural Simulation: Import buildings and entire cities into online 3D environments that can be accessed from a browser or embedded directly into your own website. We use cutting edge game development technology that enables you, your clients, project stakeholders or community members to explore, interact and collaborate within immersive 3D environments that are easily accessible. 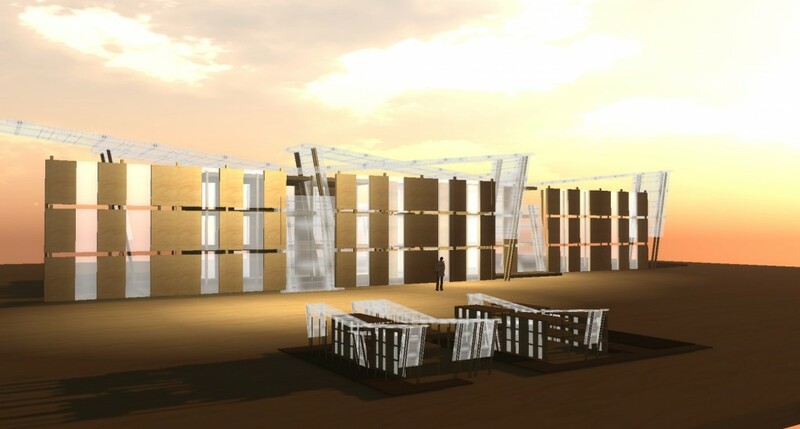 Virtual Architecture: Use virtual environments for long-distance collaboration, education, training, simulation and more. We create virtual spaces that help organizations achieve greater effectiveness and efficiency for a variety of use cases. Contact us to learn more about how your organization can make use of virtual environments. Design Collaboration: Nobody knows how your new building should function and perform better than you. Being able to witness and participate in the design evolution through interactive workshops, puts you, the end-users of your building, and other project stakeholders in the driver’s seat of the design process. Instead of waiting weeks to see the results of design changes, see them take shape immediately. Contact Arch Virtual today to learn more about how we use virtual environments to offer a whole new approach to building design. As the pendulum swings back into Second Life for some exciting new consulting projects, I’m reminded just how fun it is to build with prims and how much potential virtual environments hold for architectural practice and collaboration. You can quite literally *feel* the space as it takes shape, understanding and perceiving it in a way that no other medium affords. It’s somehow subtle and elegant in the way the virtual design experience retains the serendipity and chance of crude cardboard study modeling yet enables just enough of the precision of a 3D modeling application – but not so rigid and exact as to zap the design flow of its creative energy. The Frank Lloyd Wright Virtual Museum, which was recently granted a licensing agreement with the Frank Lloyd Wright Foundation (and later attained official 501(c)3 non-profit status from the IRS) was served a cease & desist order by lawyers representing the Frank Lloyd Wright Foundation. This is a story that hits home for me, quite literally. I live in Wisconsin, with Taliesen East just a few miles away, and I consider Frank Lloyd Wright to be one of the greatest architects that has ever lived. I’m also a firm believer in the architectural potential for virtual worlds like Second Life, and the very pursuit of architectural innovation in these environments has completely changed my life and my career path in immeasurable ways. 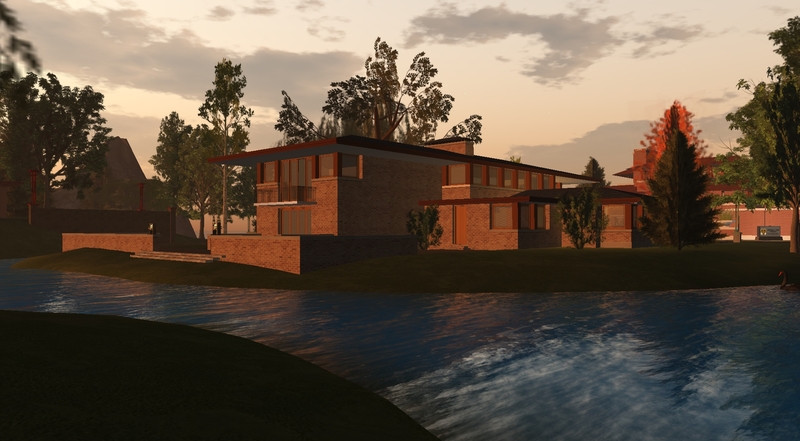 When I first created my account over 4 years ago, I did so with the intention of using the virtual world in my own professional practice, but quickly realized that Second Life was so much more than a visualization tool, it was a place. Despite its quirks and clunkiness, it was (and still is) the single largest collective expression of human creativity the world has ever seen. For me, Second Life represented a glimpse into the future of the 3D web (by any name..). Whether or not Second Life would become the standard for the 3D web, (I doubt that it will) it doesn’t really matter. I’m not invested in Second Life, I’m invested in the premise and potential of the 3D web – a paradigm that’s only growing stronger each day, and I’m more convinced now than ever before that the 3D web will soon turn all things architecture inside out and upside down. Second Life is a place to dream about how that might happen, and to start prototyping and experimenting with it. Even though most architects won’t adopt virtual worlds for several more years, there is near unanimous consensus throughout the industry that realtime virtual models are the future of online architectural visualization. This is precisely why I was impressed and inspired, and even a little surprised, that the Frank Lloyd Wright Foundation was so forward thinking and innovative in its support for the Virtual Museum through its licensing agreement. Even if a virtual tour of a Frank Lloyd Wright design is only able to capture a tiny fraction of what its like to experience the real thing, and not every detail can be faithfully reproduced – at least its something. Even if the graphic quality is still lacking because the technology is still young, its still so much more immersive, experiential and social than looking at a picture or floor plan in a book. Plus, it was a step in the right direction. As the fidelity of virtual worlds matures over time, Frank Lloyd Wright’s legacy would be right there with it, and I thought that was great. When Frank Lloyd Wright was alive, he lived ahead of his time – incorporating futuristic and innovative new technologies at every turn. He was always focused on the future, almost to a fault. Yet, for all outward appearances, the Foundation seems focused on the past with this move – perhaps out of short-term necessity, more interested in the profitability of branded merchandise. Fortunately, we don’t need a licensing agreement to carry on the *spirit* of Frank Lloyd Wright’s work in virtual worlds. Nobody holds a copyright on that, and I think that futuristic spirit of innovation is already alive and well all throughout the virtual frontier. In fact, Mr. Wright may have been somewhat disappointed in our attempt to bring heritage from the past into this new frontier, in much the same way Americans were building Victorians in the late 1800’s and early 1900’s. One of the very first orders of business in Mr. Wright’s career was to systematically dismantle that blind adherence to the past, and to find a new language of architecture for a new country, rooted in its inherent characteristics – not in an arbitrary past. He looked to the innate qualities of the environment within which he was working (quite literally, the prairie’s of the midwest) and came up with an altogether unique and distinctive vision for a new architectural language. I wish the Virtual Museum could stay open for its historical and educational importance, and I think its a short-sighted mistake for the Foundation to demand its closure, but I would argue that its far more important for us to find ways to build upon Mr. Wright’s legacy through his spirit of forward-thinking innovation, and discovering new languages of architecture that are specifically suited to the unique characteristics of the virtual frontier. If Frank Lloyd Wright could experience virtual reality today, do you think he would start replicating buildings from the past? I highly doubt it. I think he would look to the future, and proceed to systematically blow our minds with conceptual breakthroughs and futuristic ideas that even the most visionary among us would struggle to comprehend – just as he did when he was alive. I’m not a techie guy, but I know what ‘import proper 3D models’ means, and I know what a tremendous impact it will have on our industry and beyond. We’ve heard about emulator plug-ins that enable SL-like models (built within the same limitations) to be imported.. We’ve seen sculpties… But it still isn’t the fluid and automatic tool architects and designers pining for. I can say that this announcement, found on UgoTrade, is probably the most exciting news I’ve heard so far. I realize they still have a lot of work to do before this is an easy and effective solution, but based on everything I’ve seen so far, it is really starting to look like OpenSim and realXtend might be the answer we’ve been searching for.